Location: The stadium is located in the city of Ioannina (also known as Giannina), the capital of Epirus, a north-west region of Greece, 440 km from Athens. Ioannina has an airport. The stadium itself is in Anatoli, a south-east suburb of the city. It lies right next to the National Road that leads to Ioannina from the south. If you are coming from Egnatia Odos (motorway A2), you'll easily spot it on your right, 3 km from the motorway exit, at the first set of traffic lights that "denote" the entrance to Ioannina. More data: The stadium's name in Greek is Panepirotiko Stadio, which means "stadium of the whole Epirus". 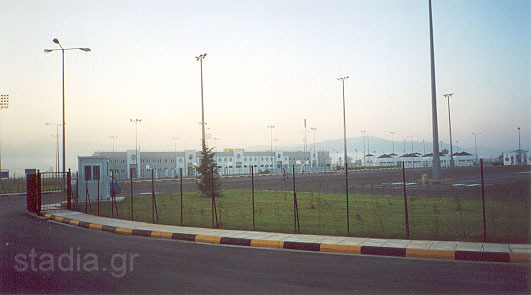 It is part of the Panepirotan National Sports Centre, which was inaugurated on 28/8/2002 at a cost of over € 10 million. The Panepirotan has been an issue of strong debate in the local community. 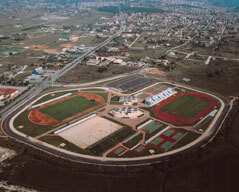 Many people believe it is too small for the needs of Ioannina and wanted a stadium of 20-30,000 capacity to be built. However, we consider this to be a mistake. The stadium is surrounded by 2 additional football fields, 2 five-a-side fields, 5 basketball, 2 volleyball, 1 handball and 4 tennis courts. There are also 500 parking spaces. The Panepirotan is a complete sports centre and can be of huge benefit to the community of Ioannina. This is far more important than the existance of stands that would be filled perhaps once every year (Ioannina also has Zossimades Stadium). The critics do however have a point, when they note the inflated amount that the Panepirotan eventually cost. 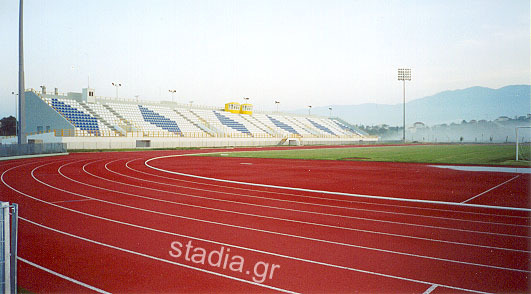 The Panepirotan Stadium is owned by the General Secretariat of Sports.